Aaron Gwin (Temecula, CA/Trek World Racing) recorded his fourth consecutive world cup downhill victory on Sunday at the RockyRoads.net UCI Mountain Bike World Cup Presented by Shimano in Windham, N.Y. His victory at the Windham World Cup helped him grow his overall series lead to a near-insurmountable 195 points with only two events remaining. Gwin, the last rider of the day, finished the 1.8-kilometer course in 2:26.416, besting Steve Smith’s (CAN/Devinci Gobal Racing) time by less than one second and removing him from the hot seat. 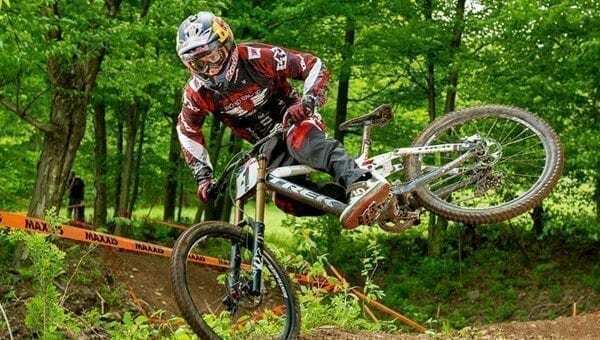 The win meant Gwin, who won the overall UCI Mountain Bike World Cup in 2011, increased his lead in the 2012 World Cup standings to 195 points over South Africa’s Greg Minaar (RSA/Santa Cruz Syndicate) who finished ninth. In the women’s downhill race, Jacqueline Harmony (Sedona, AZ) posted the top American result with a 12th place finish, approximately 14 seconds behind Rachel Atherton (GBR/GT Factory Racing) who covered the 394 meters of vertical drop in 2:52.02. The pro men’s and women’s downhill races wrapped up the 2012 Windham Mountain Bike World Cup, in Windham, N.Y.